For over 100 years the United Methodist Church has had a statement about the church’s attitude and position toward the world around us - the Social Principles and the Social Creed. Originally written in 1908 the original Social Creed focused on one of the most pressing problems of the day; our industrial society. Its focus was to encourage the creation of a just, fair and positive modern society. Over the years , in an ever widening circle, the church has realized that its voice needs to be heard in multiple arenas. 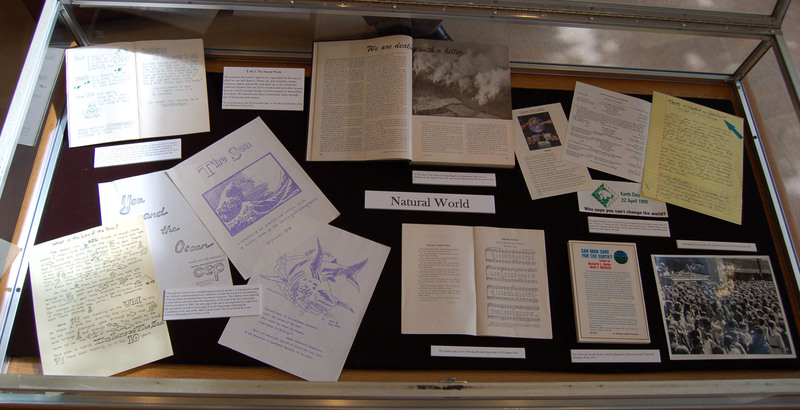 The images here represent a small portion of the display created together by Drew University and the General Commission on Archives and History to celebrate withe Drew Theological School the opening of the Social Justice Center house at the Theological School. The displays were built around the six sections of the Social Principles. All statements taken from the 2016 Book of Discipline of The United Methodist Church, Social Principles. Original Display was curated by Ms. Meghan Chapuran and Dale Patterson. All creation is the Lord’s, and we are responsible for the way in which we use and abuse it. Water, air, soil, minerals, energy resources, plants, animal life, and space are to be valued and conserved because they are God’s creation and not solely because they are useful to human beings. God has granted us stewardship of creation. We should meet these stewardship duties through acts of loving care and respect. The community provides the potential for nurturing human beings into the fullness of their humanity. We believe we have a responsibility to innovate, sponsor, and evaluate new forms of community that will encourage development of the fullest potential in individuals. Primary for us is the gospel understanding that all persons are important because they are human beings created by God and loved through and by Jesus Christ and not because they have merited significance. We therefore support social climates in which human communities are maintained and strengthened for the sake of all persons and their growth. The rights and privileges a society bestows upon or withholds from those who comprise it indicate the relative esteem in which that society holds particular persons and groups of persons. We affirm all persons as equally valuable in the sight of God. We therefore work toward societies in which each person’s value is recognized, maintained, and strengthened. We support the basic rights of all persons to equal access to housing, education, communication, employment, medical care, legal redress for grievances, and physical protection. We deplore acts of hate or violence against groups or persons based on race, color, national origin, ethnicity, age, gender, disability, status, economic condition, sexual orientation, gender identity, or religious affiliation. We claim all economic systems to be under the judgement of God no less than other facets of the created order. Therefore, we recognize the responsibility of governments to develop and implement sound fiscal and monetary policies that provide for the economic life of individuals and corporate entities and that ensure full employment and adequate incomes with a minimum of inflation. We believe private and public economic enterprises are responsible for the social costs of doing business, such as employment and environmental pollution, and that they should be held accountable for these costs. We support measures that would reduce the concentration of wealth in the hands of the few. We further support efforts to revise tax structures and to eliminated governmental support programs that now benefit the wealthy at the expense of other persons. God’s world is one world. The unity now being thrust upon us by technological revolution has far outrun our moral and spiritual capacity to achieve a stable world. The enforced unity of humanity, increasingly evident on all levels of life, presents the Church as well as all people with problems that will not wait for answers: injustice, war, exploitation, privilege, population, international ecological crisis, proliferation of arsenals of nuclear weapons, development of transnational business organizations that operate beyond the effective control of any governmental structure, and the increase of tyranny in all its forms. This generation must find viable answers to these and related questions if humanity is to continue on this. We commit ourselves as a Church to the achievement of a world community that is a fellowship of persons who honestly love one another.